I am sitting in a room is Alvin Lucier's idea of pure sound experiments. Through playback and recording of successive generations of his own voice the sound is washed until his talking is a pure harmonic. 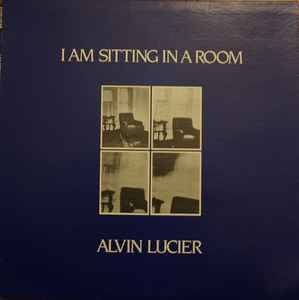 The album starts with a relatively bland Lucier.."I am sitting in a room" but as the generations progress everything becomes a pure ambient. As Lucier suggests in the recording, this sound is the dynamic of the room he records in. It is released in two parts on well pressed vinyl. This record was made by the composer on October 29 and 31, 1980 in the living room of his home in Middletown, Connecticut. It consists of thirty-two generations of the composer's speech and was made expressly for this Lovely Music record. Photography is from the original Polaroid Image Series by Mary Lucier. This is not a new idea. Steve Reich (and probably others) did this allready in 1966 with his song "come out". See discogs release "Steve Reich / Richard Maxfield / Pauline Oliveros - New Sounds In Electronic Music" or "Steve Reich - Early Works". Way better and less boring than this.